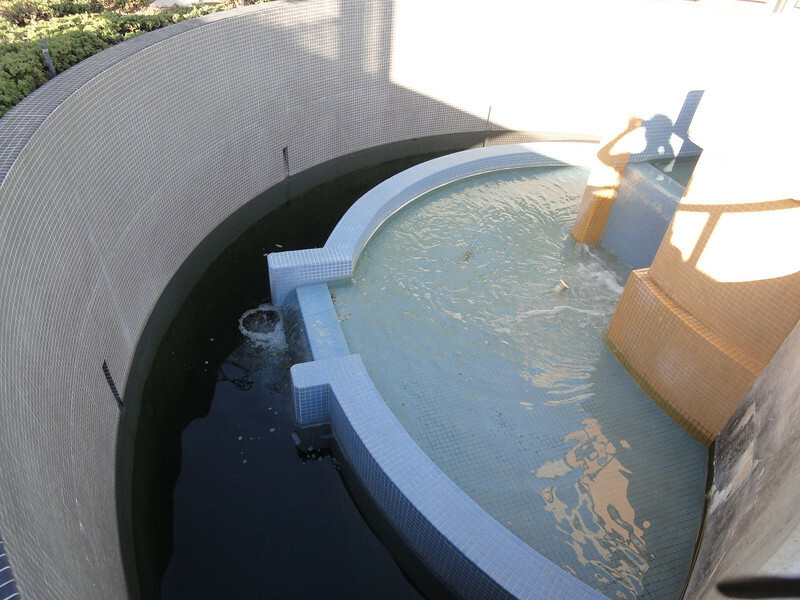 The third waterfall after the fifth and final treatment, disinfection; recycled water is stored in a 250,000 gallon tank and distributed to customers during the day and night, in order to ensure a stable flow. The Santa Monica Urban Runoff Recycling Facility (SMURRF) treats and reuses dry-weather runoff from parts of western Los Angeles City and of central Santa Monica City before this source of pollution can reach Santa Monica Bay. Over 100 million gallons of urban runoff drain from Los Angeles County into the ocean on a typical dry weather day. This flow includes runoff from landscaping irrigation, car washes, hosing down of hardscapes, pool draining and other highly contaminated sources. It is the primary source of pollution into the bay, affecting beach users and aquatic life alike. SMURRF helps mitigate this pollution by treating up to 500,000 gallons daily and recycling the water for irrigation and indoor flushing purposes. In addition, the SMURRF blends technology, art, and education to create an international example of innovative urban ecological management.